Stations are many times custom designed, but by standardizing stations for a specific project, the costs can be reduced. For an elevated station, the access is by stairs and elevators. Automatic ticketing is available, or with a season or electronic card pass you walk directly into the vehicle with no delay. 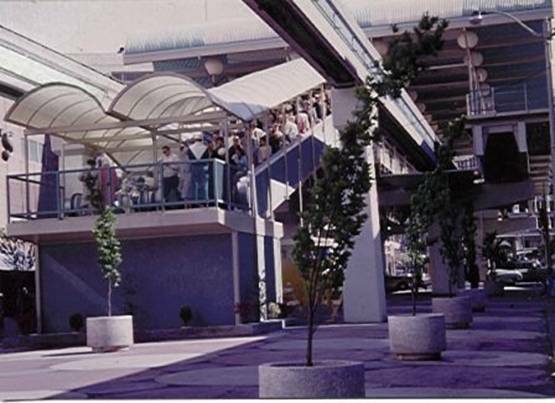 Efficient stations are a significant part of monorail systems. They serve as passenger entry and exit of the monorail vehicles and trains. 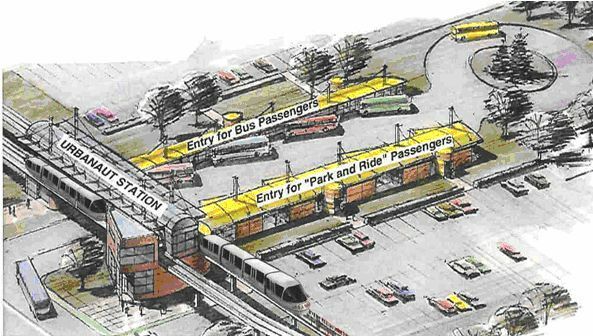 For a dual guideway, the station is designed and engineered for maximum capacity for 2 trains simultaneously loading/unloading plus emergency unloading in case escalators and stairs fail to expedite passenger exiting to the surface below. 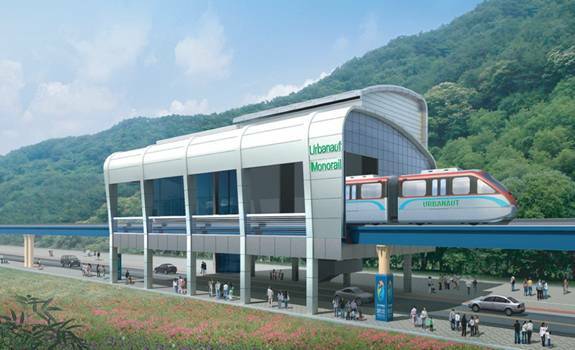 Urbanaut® has several versions of stations depending on application, service of passengers and vehicles and capacity. 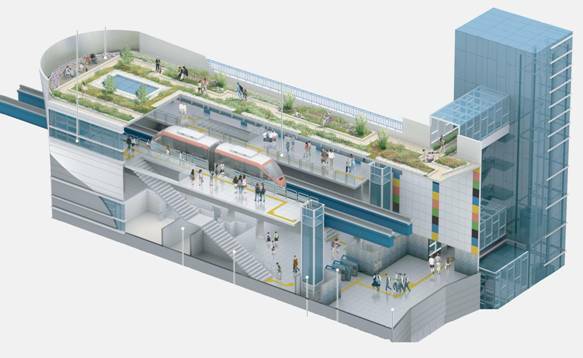 All stations are designed with minimum environmental impact and least interference with public and street traffic in mind. Where practical and economically feasible, an Urbanaut® station can be built into a multistory building. High Capacity Elevated Urbanaut® Intersection Stations are special stations designed and engineered for unobstructed free flowing surface traffic in both directions below. Such a station has the flexibility for passengers to enter and exit any of the 4 street corners. These stations have 3 optional platform arrangements (single, dual, or triple) depending on passenger capacity and space available. Note: Vehicle is guided by automatic on-board vehicle control from main line to off-line stations when entering the station, and vice versa when leaving the station. The Off-Line Urbanaut Station shown has dual uses. 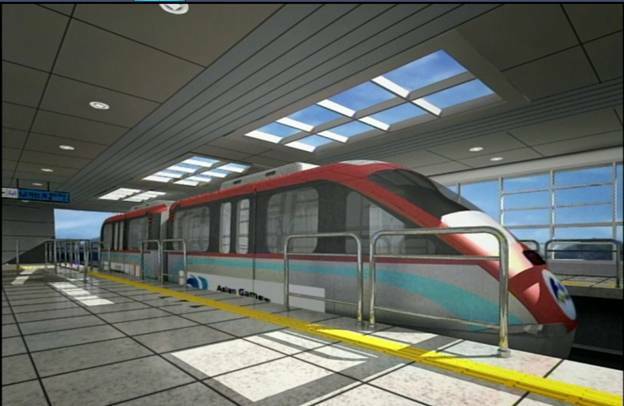 a) It can load and unload passengers on an Off-Line guideway platform while vehicles are moving by on the On-Line guideway. b) By means of simple Urbanaut® switching, several parallel off-line guideways can be added to a station for storage and servicing of vehicles. For Elevated Guideways there are 2 types of emergency escapes. a) Normal escape will be by automatic equipment similar to what is approved by commercial airlines. A custom-made "air-inflated slider" is ejected from a compartment under the door exit to the surface below. The release mechanism is activated under "visual" supervision at the Vehicle Control and Communications Center.